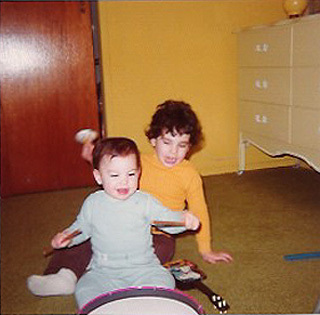 My earliest musical memories are of my older cousin playing drums in his basement for hours. There was something about being surrounded by sound—a raw, primal energy that instantly got me hooked. Adding to the fire was my musically obsessed older brother, who would blast Led Zeppelin, The Beatles, and Pink Floyd! These influences helped shape me as a drummer which I became at an early age after inheriting my uncle Daniel's and cousin Richard's drums. However, trumpet was my first intrument. I started trumpet studies at Forest Lake Elementary in Wantagh, New York. When I got to high school I studied jazz improvisation and theory under the tutelage of charismatic director Rollan Masciarelli (Maz). Maz had us playing everything from Dixieland tunes to 70s funk. For exams he had us memorizing and singing Count Basie solos note for note. In my senior year I was awarded the prestigious Louis Armstrong Jazz Award. Trumpet was my primary instrument in school and drums were my obsession after-school. I pursued private drum lessons at the Long Island Drum Center (LIDC) with Dave Stark (ddrum and Zildjian clinician) and Jerry Ricci (LIDC co-founder). I continued my education at University at Albany where I switched my primary instrument from trumpet to drums. I studied classical percussion with Richard Albagli (Principal Percussionist with the Albany Symphony Orchestra) and jazz drumming with Dave Calarco (Nick Brignola, Randy Brecker). After graduating from Albany I moved to Georgia and formed a jam band called “Everyday People.” The line up included myself on drums, Dan Marshall (Santana, Chamillionaire) on guitar, Nakayo Dupree (Speech) on flute and percussion and Tony Scott (Shade Tree Philosophy) on bass and vocals. I taught drums during the day while performing at night and setting up tours. In 2001 I moved back to New York to study at the world famous Drummer’s Collective in NYC. I immersed myself in afro-cuban, jazz, and funk and studied with such greats as Jim Chapin (renowned educator), Mark Walker (Michel Camilo), Mike Clark (Herbie Hancock) and Ian Froman (Dave Liebman). The Collective was a great springboard for playing music professionally. I played five shows a week including off-broadways, weddings, tours, and Carnegie Hall neighborhood concerts. After sustaining a sports injury I was forced to temporarily leave music as a profession. I got a job in information technology, and completed my Masters in Educational Technology. In 2010 I was dealt the biggest challenge in my life when my mother passed away from pancreatic cancer. Realizing how short and precious life is, I turned back to music for healing, and booked some regional tours with my band Changing Modes. Since then, I’ve played many festivals including NXNE and Bonnaroo and played on and produced many records. In 2013 I moved to California and started David O Lessons in Orange County. I work with students of all ages and levels to instill a solid musical foundation and a deep love of the drums! I look forward to meeting you on this wonderful journey!